Hurry to book your place at the Regency Dance Workshop on Saturday 8 October, 10 am to 5 pm, with Anne Daye at Mrs Bennet’s Ballroom, St Marks Church Hall, Church Hill Road, Surbiton, Surrey KT9 2BP. Cost: £15, tea & coffee provided, but bring and share lunch. 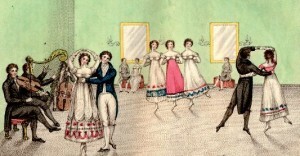 The aim of the workshop is to improve both style and steps in Regency dancing, encourage good posture, neat footwork and the way you relate to others in a set. More experienced dancers will find some interesting different dance to challenge them!